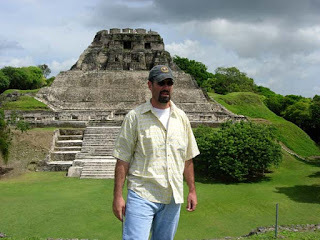 I was going through some pics of the Mayan Ruins in Belize. I worked and lived in the capital of Belmopan from 2005-'06. 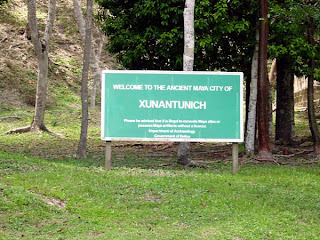 On a rare day off, my wife and I were able to explore Xunantunich, one of the many incredible sites remaining from one of the oldest known civilizations. 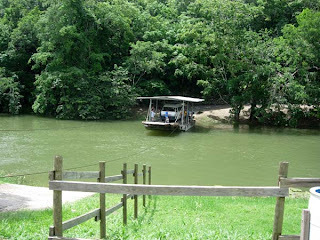 The ferry crosses the Mopan River to pick us up. 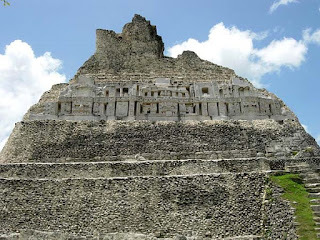 "Welcome to the Ancient Maya City of Xunantunich"
In front of the grand pyramid, El Castillo. On the steps, preparing to ascend. 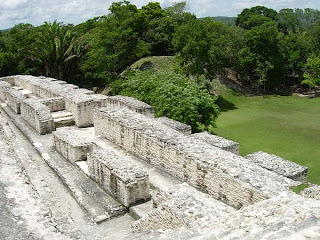 View of the main plaza from the top of El Castillo. I'll be there soon! Well not in Succotz, but in Cayo. The only place i've ever come face to face with a fer de lance was at Xunantunich. I was constantly looking out for snakes and would have jumped a mile if I had come across a fer de lance. We did find a huge tarantula coming through the drain in the bath tub. Oh, and enjoy your trip to Cayo. Great, interesting post and the photos are wonderful! Thanks for stopping by and posting on my blog INK IN MY VEINS. I'm jealous of all the places you've seen. Maybe one of these days I'll be fortunate enough to see a few myself. This makes me want to take a trip! Jennifer, I enjoyed INK and will be back. Glad you liked my old pics. Travis, All on Uncle Sam's dollar. But I have been fortunate where they've dumped me. Barrie, I've been thinking Australia or Spain lately. many years ago. The work of these ancient people is astounding. I would love to go back. At first the ruin did not seem that large until we see the two of you miniaturized in the following shot. Wow photos Dave. Just lovely pictures, David. You've lived in a few really different places. What incredible sights - how different from My Muskoka! I'm so glad you shared them. I like a virtual trip, especially sans snakes. Don, It's a monster. I'm surprised more people are not hurt descending because it's very steep and the steps are very narrow in certain spots. The day I went there wasn't even a tour guide or official in the area. Patti, Thanks. And maybe another intriguing stop in my future this year. Keeping fingers crossed. Jenn, Sans snakes is in my contract. Indy Jones and I have that in common. Heck, you had me at ferry. That water looks gorgeous but I bet deadly. How blessed you are to have served there. 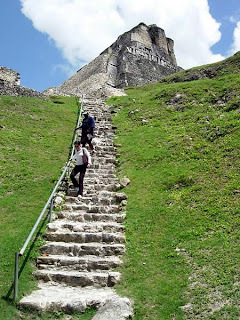 I've seen some Maya ruins and climbed up a pyramid or two. I now take stairs the way our guide told us they did, in a zigzag, and it helps considerably. 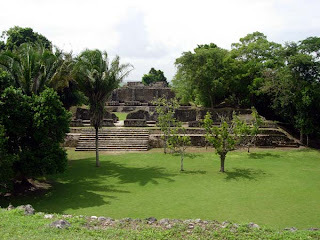 I've been to the Incan's Copan in Honduras, and it was interesting/unsettling to me how dangerous the rude mountain roads were to get there and how wild the surroundings remain. But then, I sort of like when it isn't completely pre-digested for my safety, because I can imagine the past better. Beautiful pictures of you both and your friends, the breathtaking pyramids. 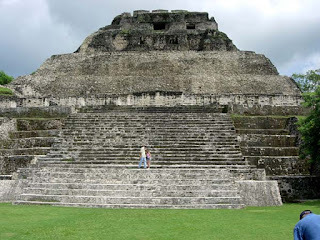 I've heard Belize is a wonderful spot on earth. Thanks for the post and the gorgeous photos. I'm not much for humidity and bugs in real life, but love the photos. Years ago, I went to Anadarko, Oklahoma where there are replicas of various native dwellings. One dwelling--when I went inside, the feel and the smell were so pleasant, I thought, "I could live here." Did you feel that way about any of these buildings? RReynolds. Undoubtedly they were present and thankfully I didn’t have to find out first hand. Leah, I forgot about the zigzag but remember someone (maybe afterwards) saying it made the climb easier. Mental note for next time. 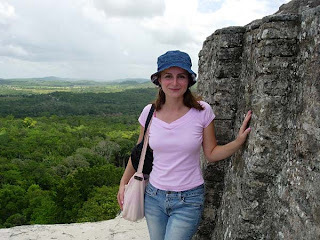 Clare, If you ever go to Belize begin with San Pedro and Caye Caulker. Beautiful spots. Ddusty, I can’t say I’ve ever felt at home in these foreign countries though I’ve enjoyed visiting. As soon as the plane touches back down anywhere in the good old US I’m home. Thanks for stopping by and I will click over to check out your blog. Is it possible you are Allan Quatermain's grandson? Nice post and top photos. Yes, I'd like to be hanging out with you guys in these pics. So beautiful David. I'm not sure I could do the climb these days, so thanks for sharing your lovely photos. wonderful post and fascinating photos. This was an excellent armchair virtual tour, David. I love anything to do with archeology. Hairy spiders and venomous snakes I don't care to see, thank you. What did you do with your tarantula? All fascinating, but the charmer gets my vote. Great post. 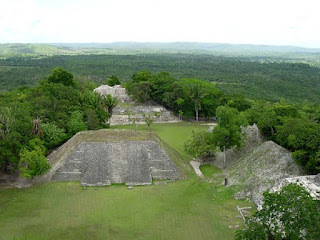 Charles, I believe you mentioned the Mayan ruins in a recent post and that’s what triggered the memory. Reb, And I’m not sure I would want to again myself. That was a helluva climb. Barbara, True story. He was sitting above the drain plug and as I approached with my trusty broom, he lifted!! the plug and crawled down inside. Dave, You just made her morning. I like the "retro" concept . . . especially when it features such a fascinating place.